I must say that I wasn’t expecting to be awake and lucid so soon after a general anaesthetic. 5 hours ago I was lying in theatre waiting for the drip in my hand to send me off, chatting with the nurse who has a child in my daughter’s class, reminiscing about the school show the kids did last week performing the Pukeko Stomp in cute wee masks; joining in on the anaesthetist’s discussion about the Archbishop of Canterbury’s call for people to reconsider a consumerist Christmas…then suddenly it’s 2 hours later and I’m with all the other post-ops, being reminded to breathe (that’s the morphine, love) and eating the yummiest lemonade ice-block I’ve ever tasted. Where was the disorientation and distress I recall so vividly from my last general anaesthetic 40 years ago when I was 5? I guess the drugs have got a lot better. My bright red toes are sticking out the huge lump of plaster that will be my friend and foe for the next 6 weeks, while my good leg has a sleeve on it that keeps pumping up & squeezing my calf to keep things moving. This is the easy bit. 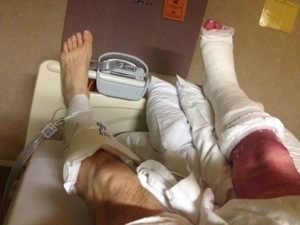 The recovery/rehab will be in 6week blocks…rather intimidating. The nurse who brought me up to ward said her husband also needs the op to fix his Achilles but the long rehab is such a hurdle (pun intended). I’m not thinking about that right now. I’m gobbling ham sammies and tomato soup, waiting for a visit from my wee girl, keen to show off my cast… I have a pen ready for her to sign it. Well, I guess I was being a little sentimental. She was rather unsure about seeing me. Very wide-eyed and hanging back. Fair enough. I may be chipper but I’m not the looming, tall rumble-tumble Dad she’s used to. Not sick or sad, but not quite right. She was very keen to get down from our awkward cuddle in bed. 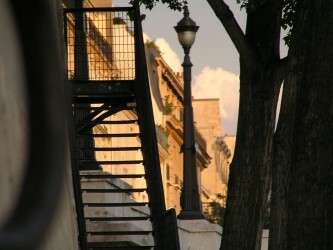 I imagine it will change when the surroundings are more familiar after I get home tomorrow. I say home. I’m actually going to the neighbours but that’s as good as home to her. She know’s where the boy-next-door keeps his felts so my bright white cast will be well-decorated after she gets back from school. 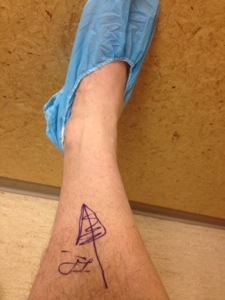 This entry was posted in Blogs and tagged Achilles Tendon, Haglund's Deformity, post-op on November 13, 2013 by Kambl.